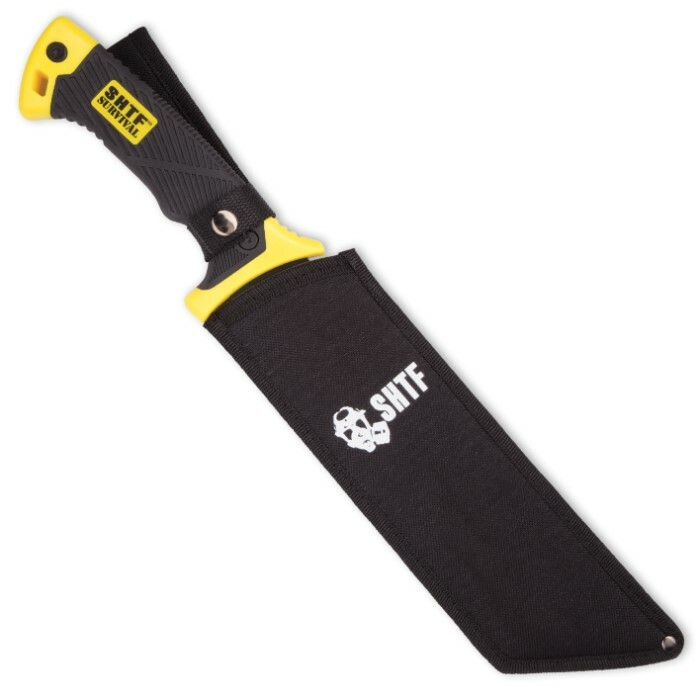 SHTF Jungle Hunter Tanto Machete with Nylon Sheath | Serrated Spine | BUDK.com - Knives & Swords At The Lowest Prices! 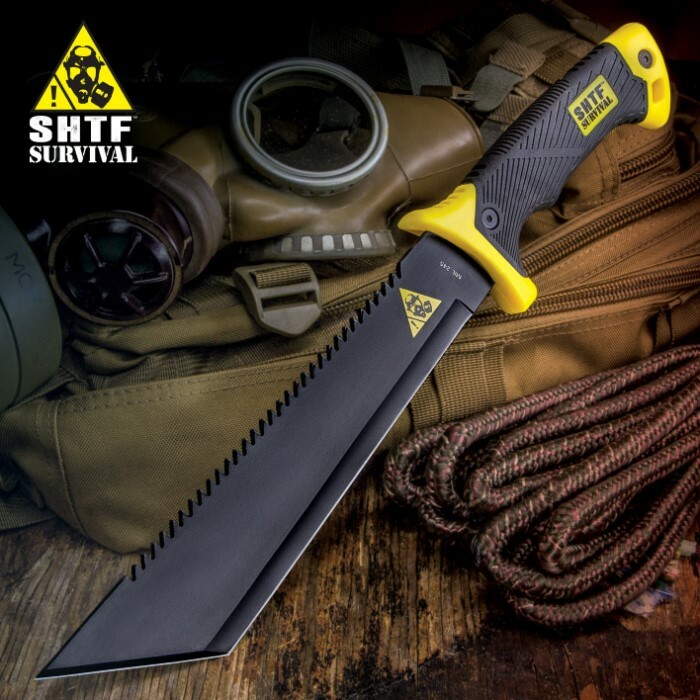 The SHTF Jungle Hunter Machete fuses the legendary, piercing tanto blade with the classic bush machete to yield a savage machete capable of tackling any chore. 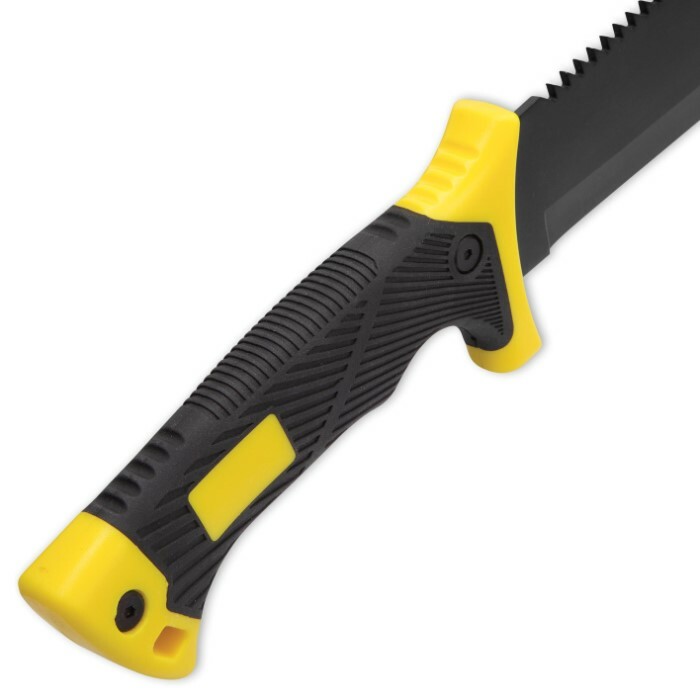 Its impressive blade is robust enough to chop firewood, yet lithe enough for delicate backyard pruning. The bitter serrated spine makes quick work of especially dense hardwood and other challenging materials, while the iconic tanto point yields incredible penetrating power. Engineered for harsh conditions and tough environments, the Jungle Hunter’s impeccable weight distribution and tough rubberized polymer handle provide maximum control and a superb feel in even the soggiest wetlands, the craggiest mountain terrain and - as its name suggests - the thickest, most harrowing jungles. No matter where you take it, however, the Jungle Hunter is easy to transport, thanks to the included heavy duty zippered nylon belt sheath. And, trust us, you'll want to take it everywhere and brandish it every chance you get! Use it just once, and the savagely potent Jungle Hunter is bound to become your go-to machete for any outdoor adventure! 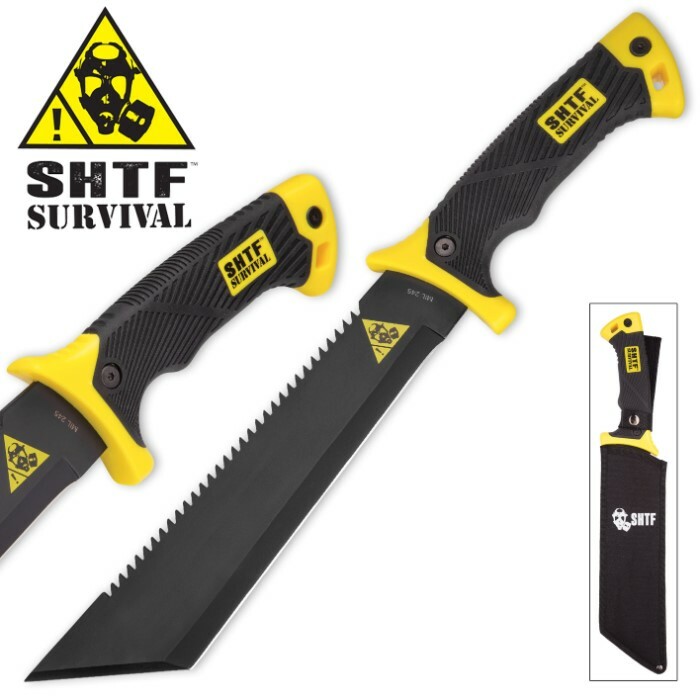 Regardless of what you're hunting - wild game or simply a good time - the SHTF Jungle Hunter Bush Machete is always poised and ready to slay any beast of a task. Can’t beat the price gonna have to purchase more for all the bug out bags !! Have purchased 4 of these and is one of the best products i have ever bought.You must purchase this,it is a must have.Thanks BUDK! 12/14/2018.